German rabbi; born in Galicia 1857. He studied in Berlin under Hildesheimer, became rabbi at Winzenheim, Alsace (1884-1890), and preacher for the Federation of Synagogues in London (1890-94), and, since 1890, has been chief rabbi of Altona. He wrote "Anlage und Quellen des Bereschit Rabba" (Berlin, 1882) and has contributed to various periodicals ("Berliner's Magazin für die Wissenschaft des Judenthums," "Der Israelit," "Jüdische Presse," "Jewish World," etc.). His literary work is devoted almost exclusively to the defense of Orthodox Judaism. 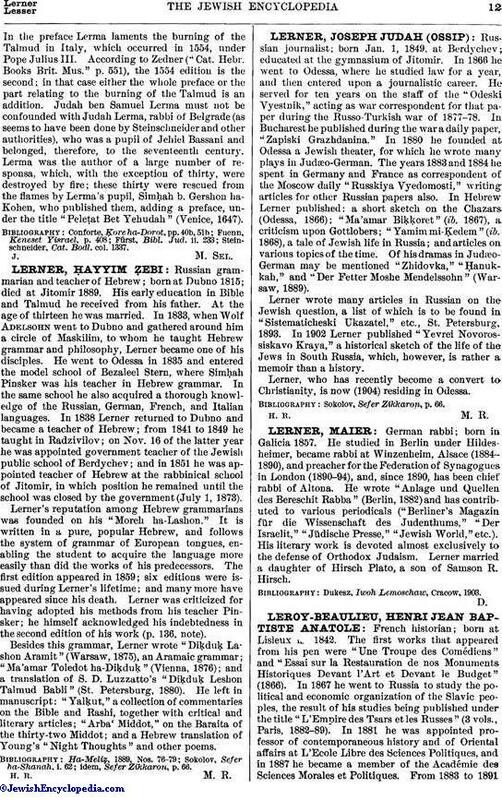 Lerner married a daughter of Hirsch Plato, a son of Samson R. Hirsch. Dukesz, Iwoh Lemoschaw, Cracow, 1903.